"Want to learn awesome new tricks and laugh for two hours straight? Take a workshop from Caitlin. She's got a way of teaching you fun and exciting moves safely, whilst entertaining you with her comedic nature. She's also genuinely excited for you when you get something. You'll leave with more skills, more confidence, and more laugh lines." Whether you are looking to have a good time trying something new, striving to become proficient on a specific apparatus, or looking for a little inspiration and assistance in creating or polishing an act, Caitlyn can fill your need. Before the circus stole her life, she earned her BFA in Theatre from New York University, which provided a strong background in creation and directing, as well as performance. Caitlyn is an artist, instructor, director, and perpetual student of the circus arts. She has trained and taught in schools in Europe, Oceania, the States and the Caribbean. Her interest in circus lies in where the physical meets the dramatic and her specialty is storytelling and theatricality. Circus is more than a show and tell of learned tricks, its an opportunity to share an idea with the world. Caitlyn teaches flying trapeze, aerial silks, static trapeze, duo trapeze, triple trapeze, corde lisse, spanish web, lyra, duo lyra, and trampoline at an advanced and performative level, and partner acrobatics and juggling at a beginner level. Please contact her for info on schedule and rates. A student displays one of many badges of honor from a training session. "I have had the privilege of taking private lessons and group classes from Caitlyn on apparatuses ranging from aerial silks to static trapeze. Caitlyn’s classes are very challenging yet fun, and I can always feel the “circus pain” in my body the following day. Caitlyn focuses on giving every person in class individual corrections and encouragement. My strength, technique, and artistic development have significantly improved as a result of training with Caitlyn." *Each workshop can be tailored to fit your needs in terms of length, ability level, rigging height, etc. Please contact Caitlyn to chat specifics. At some point in your silks journey, the time comes to break down all those crazy knots and belays, and understand what is keeping you from plummeting to the floor. In this workshop, we delve into the basics of these knots and holds while learning some higher level tricks. See a back flip into a single knee hang - learned broken down into slow, attainable steps - and discover how handstands can end in windmills. This workshop is for intermediate to advanced students. Requirements: Ability to invert in the air (multiple times in one class) and efficiently complete wraps for at least 2 drops (ex: double star drop). Take your fabric work to the next level with new ways to ascend and wrap. Discover just how many options there are to get high as you delve into unexplored aerial territory, twisting and contorting in awe-inspiring, but secretly simple, ways. Find new paths into and out of old tricks and create new ones in the process. Prerequisite: Ability to invert from a climb, foot locks. Rope tends to be seen as silk's red headed stepsister, but it can be an incredibly versatile apparatus. Whether you're looking to be like the strong man or the graceful woman, rope has something for you. Learn the basics of maneuvering on this piece of equipment while being shown some tips and tricks for cleaner technique. This workshops will also include some creative poses and drops. Prerequisite: Ability to climb silk or rope without assistance. Do you love supporting other people? Letting others hang from you while enduring various amounts of pain and cinching? Then this is definitely the workshop for you. We will get an overview of a variety of different ways to hold weight while on the fabric and delve into the mechanics of balancing while doubled up in the air. There will also be directed play for the invention of new basing techniques. Then we will move past positions and into transitions - how to seamlessly move from one basing position to another, without your act looking like another "trick, pose" routine. Pre-requisites: Ability to invert in the air, an open mind about basing AND flying, and the mindset to always take care of the person who's in the air with you. Although standing on your hands seems fairly simple, there is a lifetime of technique in mastering the skill set for a solid and steady handstand. In this class, master the basics and figure out how to turn yourself upside down safely and efficiently. If you already have your handstand, learn techniques for improving your form and the steps necessary for moving onto more advanced moves, like lever ups and one handed handstands. In addition, we will delve into some deep partner stretching and go over some ways to increase and maintain your flexibility. No experience necessary. ​Take your acro off the floor! This workshop will give you the foundation to be a solid base, a tight flyer, and a hands on spotter. Learn the basics of basing on your legs, shoulders, back and hands in a safe and supportive environment. For the more advanced students, there is the opportunity to try some hand to hand (doing handstands on your partner’s hands) and some dynamic transitions and combinations. 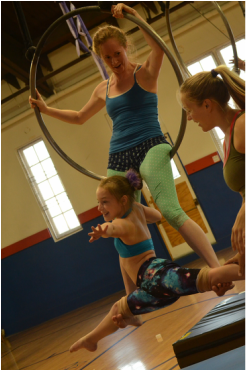 ​Circus arts requires incredible amounts of strength and flexibility and can be quite rough on the untrained body. Due to the specialized movements, it can be difficult to find the appropriate cross training activities. Fit to Fly brings aerial conditioning and flexibility training to a whole new level of accessibility - 90% of the exercises can be done at home, on a pull up bar or at a playground. Discover new ways to bulletproof your body from injury, techniques for actively improving flexibility, and a whole slew of exercises that specifically target aerial and handstand muscles. Discover a new way to empower yourself with aerial arts. Perfect for those brand new to the circus world, static trapeze offers a great mix of physical intensity and aerial artistry. Learn how to properly and safely hang, invert and support yourself while trying various poses and tricks. Walk away with sore muscles, a new physical vocabulary, and a sudden eagerness to show up the kids at the playground pull up bars. No experience necessary. Discover the fluidity of trapeze with this lower, spinning, single point version of static trapeze. Learn to add a graceful dexterity to your aerial skills as you are shown new techniques for spinning under and climbing onto the apparatus. Get to know the ropes and see how versatile they can be. Within minutes, you will be soaring around the room as you perfect stunning poses and transitions. No experience necessary. Lyra is a beautiful apparatus, though it often seems to be best suited for never dizzying contortionists. This class will teach a few foundational dynamic moves and then delve into the endless ways to flip, roll and spin around this beautiful circle of metal. Please wear tight fitted clothing and bring long sleeves or elbow pads if you want to try elbow circle. ​Requirements: Ability to invert and sit up on lyra without assistance. Lyra is a beautiful apparatus, though it often seems to be best suited for never dizzying contortionists. For those of us who don’t fold up like a pretzel, double lyra is seldom tapped goldmine of stunning poses, innovative basing, and graceful transitions. It’s a fantastic vessel for creating exciting new work with ample opportunity for heavy character work. Requirements: Ability to invert and sit up on lyra without assistance. How do you begin to create an act? How do you work with others and maintain your true vision? How do you ensure a maximum response from the audience. For too long, the aerial arts have been a breeding ground for trick/style poses and slow, pretty, but often boring routines. Discover how to add theatricality back into your art. Find techniques for developing character and theme. Learn how to ask and answer the right questions and make something that will demand a reaction. Requirements: Taken at least 5 aerial classes on either silks, lyra or static trapeze.